“Sweetgrass” is an unexpectedly intoxicating documentary, unexpected because it blends high artistic standards with the grueling reality of one of the toughest, most exhausting of work environments. 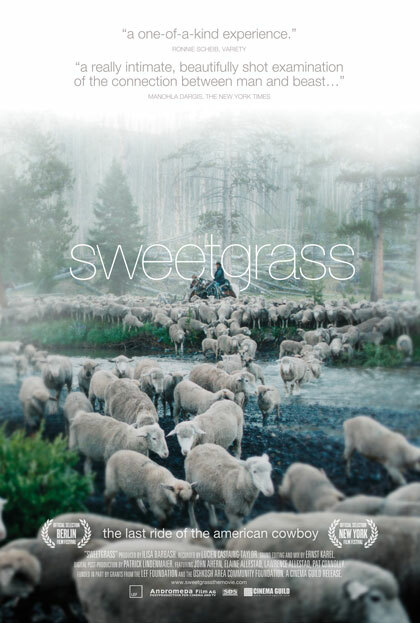 For though the area of southern Montana where “Sweetgrass” is shot is a visually stunning locale, running a sheep ranch in general and caring for enormous flocks during their months of summer pasture in particular turns out to be a grueling, intensely physical existence grounded in the unforgiving rhythms of the natural world. Made by filmmakers and anthropologists Ilisa Barbash and Lucien Castaing-Taylor, “Sweetgrass” consciously echoes the celebrated 1925 silent documentary “Grass,” a record made by the future “King Kong” duo of Merian C. Cooper and Ernest B. Schoedsack of a staggering annual migration by Bakhtiari sheep herdsmen in what was then Persia. Made as well in the restrained tradition of Frederick Wiseman, “Sweetgrass” is intent on doing no more than observing, on having as unobtrusive a presence as possible in the world it is recording. But that world turns out to be as compelling as the circumstances under which the film came to be made. Castaing-Taylor and Barbash were invited on a sheep drive by Lawrence Allested, the last rancher in the area to undertake this kind of an annual journey from his ranch in Big Timber to pasture in the U.S. Forest Service’s Absaroka-Beartooth Wilderness. Castaing-Taylor, who gives himself a “recorded by” credit as opposed to “director,” spent the entire summer of 2003 with the herd, and he and his wife returned to film two other drives as well as the varying tasks that fill up the rest of the sheep ranching calendar. As it turns out, Allested was more prescient than he knew. When a change in government policy meant that the ranch’s permits to graze on federal land were not renewed, the ranch ended up being sold in 2006, leaving this documentary as a record of a time that has truly gone by. Put together from footage from all that filming, “Sweetgrass” shows us a year in the life of this kind of ranch, displaying without commentary the myriad tasks that need to be done, such as the playing god aspects of helping young lambs stay alive and the astonishing virtuosity needed to shear full-grown animals as fast as possible. The heart of the film, however, is the sheep drive that gets the beasts to pasture and the long days and nights spent with them up in the wilderness. The 150-mile drive itself is a major logistical feat, using hired hands, hard-working dogs and the entire Allested family. Up at the pasture land, everything gets quiet, but only to a point, as the two men left there with the sheep, eccentric old-timer John and the younger, more querulous Pat, have to contend with their personal troubles as well as bears and wolves intent on doing their worst to the flock. To hear Pat on a phone call to his mother, talking of his woes while standing amid visual splendor and concluding, “I’d rather enjoy these mountains than hate ‘em” is a special moment indeed. Helping to make the entire film special is the remarkable nature of “Sweetgrass’ ” footage. Not only is the Montana landscape beautiful to look at, but the filmmakers have an unerring eye for impeccable compositions and unexpected vantage points. Everything is done with the kind of restraint that is both the ideal complement to a grand physical setting and a fitting tribute to this disappearing way of life. KENNETH TURAN. Los Angeles Times. March 26, 2010.